Now you know me, I love gangster movies and I'm fairly fond of Johnny Depp too. 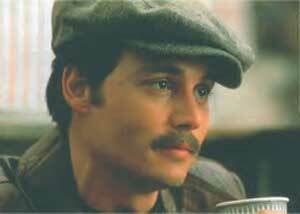 So Johnny Depp in a gangster movie is always going to score highly in my book (and indeed on my website). 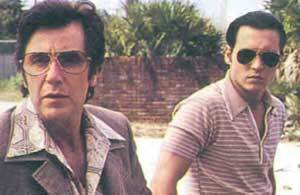 But my personal predilections aside, Donnie Brasco is an excellent film. Based on the true story of Special Agent Joseph Pistone, whose undercover work with the New Jersey Mafia lead to hundreds of mob convictions, the film tells of how, as Donnie Brasco, he infiltrated the mob under the mentorship of aged gangster Benny Ruggiero, aka Lefty, aka the fabulous Al Pacino. Lefty is a rather sad little man: proud of the fact that he's 'known for getting by', getting by would appear to be about as good as it gets. Constantly overlooked and lacking respect in the Mafia family despite years of faithful service, his life is in decline: his son is a junkie, he's always short of cash and he suffers from 'cancer of the prick'. Of an evening he's to be found slumped in an armchair smoking a fag and watching prescient nature documentaries about predators and prey. And then along comes Donnie, who looks up to him, relies on him and is always a soft touch for a dollar or hundred. Charmed by his new young friend (and who wouldn't be - at least once he's shaved his moustache off), he takes him under his wing, vouching for him with mob boss Sonny Black (Michael Madsen, in a similar psychotic role to Reservoir Dogs' Mr Blonde). And so, as Lefty's man, Donnie is inducted into the world of the Mafia: a world of casual violence, where money is easy and life is cheap and 'every day you're looking over your shoulder'. The film captures brilliantly the constant sense of tension inherent in mob life, the fact that you never know whom you can trust, or when you might walk into a darkened room and find yourself whacked. For Donnie, of course, the tension is doubled: not only is he in danger as a mobster, but because he is a rat. If his cover is blown, not only will he die, but Lefty will too. And as Donnie and Lefty become increasingly close, Donnie becomes more and more concerned for his old friend. If he's to do his job properly and bring the mob down, Lefty will be the first casualty. Although the film pivots around this cetnral dilemma, there is much humour to be found (Donnie and Lefty's exchange of Christmas presents is nice) and quite a bit of gore as well (those of a squeamish nature should look away when Donnie is forced to hack up a body with a saw.). Many of the scenes are painful in the extreme: for example the moment when Donnie refuses to remove his boots in a Japanese restaurant because his wire is strapped to his ankle and earns the poor restaurant owner a sickening beating, is almost unwatchable. As tends to happen in undercover movies (think Reservoir Dogs, Point Break or the utterly terrifying ID, which gave me nightmares after I saw it), as Donnie becomes immersed in mob life, he finds the gangster attitude (and language) rubbing off on him, at the expense of his family life. 'The man I married was a college boy!' laments wife Maggie (Anne Heche, who, looking like a cross between Mia Farrow and Shelley Duvall, is one of those people who seems totally at home in the 1970s). However, from the start we realise that Donnie is not at heart so very different from the gangsters: like Sonny Black, he is a man who chooses his words carefully and plays his cards close to his chest, who is dedicated to his work and will stop at nothing to get it done. Although we never at any point really believe Donnie will do a Reece Dinsdale and go over to the dark side, we know that if he did, he'd make one hell of a gangster. As with Blow, it's not until you hear the real Pistone talking (yup, been watching those DVD extras again) that you realise quite what an accurate portrayal Depp is pulling off. You never actually get to see Pistone, as he still has a $500,000 contract out on his head, so appearing in DVD extras would not be the smoothest move in the world. 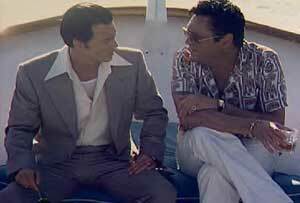 However, he did act as a technical adviser on the film (as did several real gangsters - let's hope their paths never crossed then) and indeed everything about Donnie Brasco rings incredibly true. Of course my knowledge of mobsters is gleaned entirely from the movies anyway so how would I know? However, as Lefty schools Donnie in the Way of the Wise Guy, so we also learn what it takes to become a made man. Because being a gangster is not a job, it's a lifestyle, with its own rules, taboos, lingo, code of honour and rigid hierarchy - there's a reason why FBI agents in gangster movies always map out mob relationships as family trees. But it's not just the little details that make Donnie Brasco credible: the language (learn the subtle differences between 'a friend of mine' and 'a friend of ours' and the many definitions of fave gangster phrase 'forget about it'), the intricacies of mob etiquette (nobody touches a made man, no wise guy uses a wallet and moustaches are banned - hooray!) or even the dress code (jeans are out, sharp suits with loud checks or stripes and shirts with enormous flyaway collars are in). Instead it's the relationships and emotional situations, the touching father/son bond that grows between Donnie and Lefty and the heartbreaking conflict of loyalties as Donnie is torn between his duty to the FBI and his love and respect for his new friend, that give the film its powerful depth and resonance. I won't give away the ending, but it seems to me from the sombre opening credits (which reminded me somewhat of another amazing Al Pacino movie, Carlito's Way) to be inevitable. Suffice it to say that Pacino's final scene is one of the most moving cinematic sequences I've ever seen, definitely one of his finest moments. Featuring first class performances from Pacino and Johnny Depp (and let's face it, even the Deppmeister can't act the Godfather off the screen), Donnie Brasco is a truly great gangster film, closer to the tracksuits and tantrums of The Sopranos than the glamour and gore of Goodfellas or the epic sweep of The Godfather, and as such I think it perhaps paved the way for the acclaimed TV series. Just another excuse to ogle Johnny Depp? Forget about it.